It is a month that we recognize children of soldiers and their sacrifices. I was a Military child. My children are military children. Being a child of a soldier doesn’t go away at retirement or separation from the Armed Forces. Any soldier will tell you that their service changed them. For Military children, that means the service changes the family. My husband has been out of the Army for a little under three years now. When I look outside my bedroom window I see a sign from his division, something he is proud of. In our formal living room there is a certificate honoring me for my volunteering signed by the Commanding General at the time. That’s something I’m proud of. My kids who were alive while he was enlisted each have a ‘Daddy Blanket’ a simple quilt made from old uniforms and fabrics they liked with a uniform pocket in the center to keep special things in. During deployments these blankets were constantly with the kids. So, aside from deployments, what sacrifices does the Military child make? I can’t speak for every child, but I’ve gotten pretty good at speaking about mine. 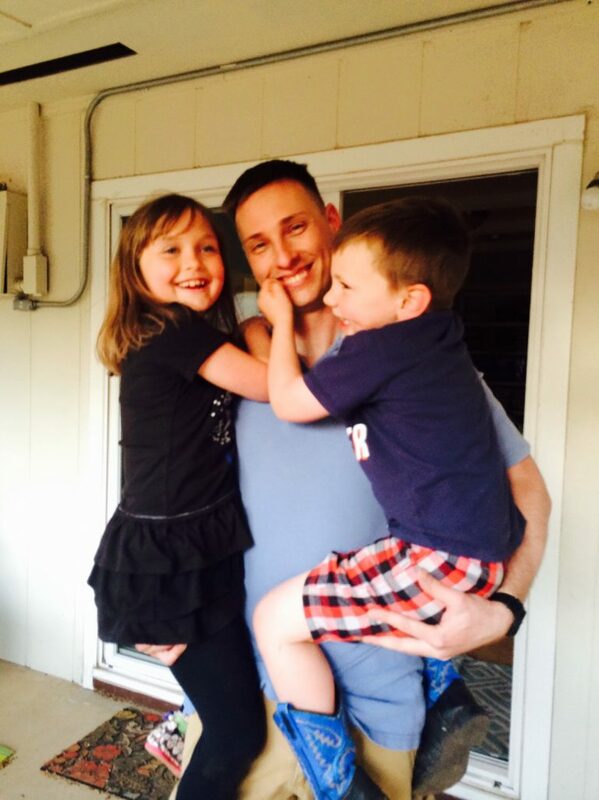 The effects of my husband’s deployments are still felt by him, and so of course the kids feel it too. Emotionally, he has a much harder time connecting. He was always the better, softer parent and that is unfortunately not the case anymore. It takes effort for him to get up and connect with the kids about 75% of the time. E used to love to play Hide and Go seek with Hubs. It was their favorite game. E would go hide and wait for Hubs to be walking by as he did things around the house. SURPRISE!!! Hubs would chase E and they would laugh as they collapsed and rough housed on the floor. That’s not a thing that they do anymore, E used to try but Hubs would freeze and get this look on his face. If I wasn’t there he’d start yelling, if I was, I’d have to physically get in front of him and remind him where he was. It takes a lot less to upset Hubs. Considering we have a hormonal preteen now, that’s pretty rough. Love is patient… not after two deployments. A talks about missing her old daddy. She was the oldest and remembers him the clearest. I miss him too, I miss the tucking them in and the bedtime stories. The lighthearted approach he had towards everything was something I respected about him and wished I could have. I don’t blame her for missing him but I remind her that he’s in there somewhere and it’s our job to help him come out. C is being raised by a completely different man. She will have no memory of her father in uniform but she will still be a Military child because his time in the service will never leave him. When I watch him with her though… I know that gentle man I married isn’t gone completely, he’s just been hardened and he’s afraid to come out. By far, I’d rather my children and I be living with Hubs the way he is than be one of the thousands of military children who will never have another movie night or deep conversation with their father because he’s gone for good. These are the gold star families. These are the families who need our appreciation and respect every single day. Some lost their fathers thousands of miles away, others in dealing with the internal battles being away caused. Military children are raised to be resilient, to say goodbye to parents they want to cling to for the good of our country, but they are still children. They just want their mommy or their daddy. Or many local organizations near military bases make quilts or dolls for children of soldiers.